Getting out on the water is a big part of life in Maine, for so many. A couple of sailors say they never thought they'd compete in races across the world. Now they are one of eleven teams from nine different countries competing in the Atlantic Cup and the finish line, is home. 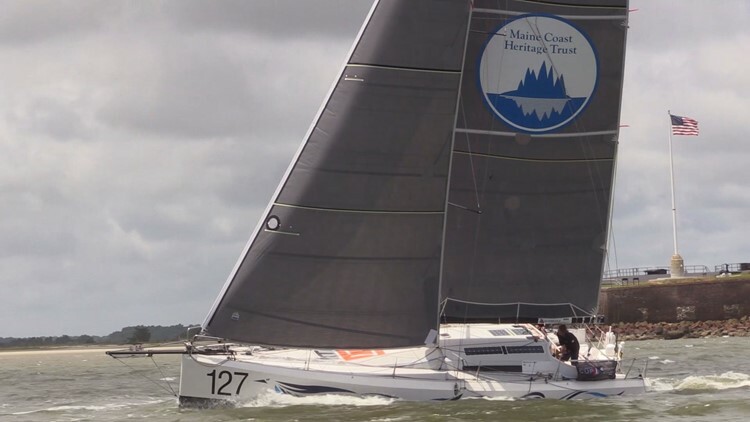 PORTLAND (NEWS CENTER Maine) -- Come Monday Mainers will be keeping an eye out for number 127, one of eleven Class40s competing in the Atlantic Cup. Team Amhas is made up of a couple of Mainers, Micah Davis and Rob Windsor. They came in 2nd in the first leg of the race that went from Charleston, South Carolina to New York City. This weekend they'll set sail from the Big Apple to the Pine Tree State. "We of course love being home," says Micah Davis. Davis is from Harpswell and Windsor lives in Portland. They say nothing beats a "home-port" advantage. "I mean it's special we've raced all over the world," says Davis. There's not many times you get to sail into your home port. See your family. It's a neat feeling, I'm not sure how to describe it." Usually sponsor logos are splashed onto sails and hulls. But the Portland team is sporting the Maine Coast Heritage Trust symbol, to raise awareness for the conservation non-profit. "We all come to Maine because it looks like Maine," says Davis. "We want to make sure people know about land conservation and know about all the hard work that goes into preserving our coast." And on their uniforms: Warrior Sailing's logo. "It's really just about making sure that our veterans get a chance to go out and compete and get on the water," explains Daivs. "The ocean's a pretty special place for both of us." This is the sixth year for the cup and the second year the finish line is in Portland. The best place you can catch all the action? "The eastern prom," Davis and Windsor say simultaneously. "Portland's a really nice amphitheater for racing," adds Davis. They next leg of the race begins Saturday afternoon. They expect to arrive in Portland Monday. The race includes teams from nine different countries. Right now, Davis and Windsor's biggest competition is team #145 Eärendil, a duo from France and Italy, that finished right before them in the first leg.